Native to China. Fossils have been discovered in regions east of Xi’an and south of Harbin. Père David’s deer evolved in the Pliocene period of the Tertiary, according to fossils excavated in southern Japan. During the Pleistocene period, it was known from Manchuria and, during the Holocene, it was restricted to swamps and wetlands in the region south and east of mainland China due to the encroachment of human development. Like all deer, grazes on plants, mostly leaves. In this case, also many aquatic plants as this deer species is adapted for life in swamp and marsh regions. How Long Père David’s Deer Live: Up to 18 years. These deer were easily hunted in their wild habitat of open plains and marshes. The last known wild individual was shot in 1939 near the Yellow Sea. However, the Emperor of China, who had installed a large herd in his Imperial Hunting Park (Nan Hai-tsu Park) near Peking, inadvertently helped to prevent extinction of the species. His private herd thrived in the park, surrounded by a 43 mile long wall and protected by guards. A French missionary, Père Armand David, was very curious about the contents of this secret park. On May 17, 1865, he convinced the guards to allow him to look over the wall. By chance, a herd of these deer walked by. His attention and energies in learning about this deer ultimately resulted in royal gifts of several pairs successfully sent to Europe, where they multiplied quickly. Things looked brighter for the species until 1895 when a catastrophic flood in China destroyed part of the wall surrounding the park. The animals in the park were either swept away by the floods, or if they escaped safely, were hunted and killed by the starving Chinese. Only 20-30 deer survived in the park after the catastrophe. Those died five years later, during the Boxer rebellion, when troops occupied the Imperial Park and killed and ate every deer. 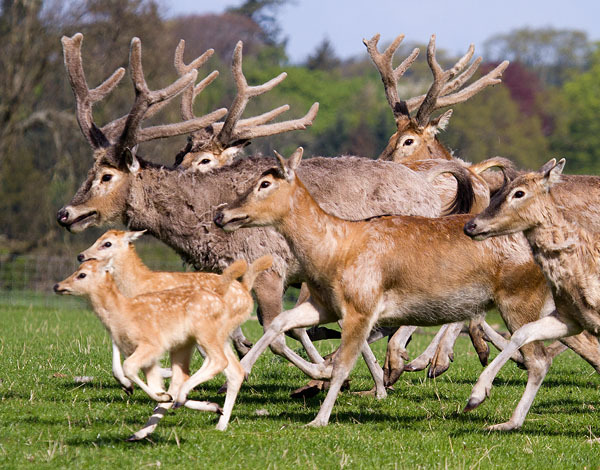 European zoo directors rallied when hearing of the loss of the last deer in China and sent all of their breeding Père David’s deer to the Duke of Bedford’s Woburn Abbey. Of the 18 animals, one stag and five hinds eventually bred. The population increased to around ninety animals until World War I erupted. Again, the population reduced to fifty animals due to a food shortage. The population rebounded to 300 by 1946, but then World War II created more food difficulties. In order to reduce the threat of destruction by bombing, the Duke of Bedford sent four deer to the Peking Zoo. By 1970 over 500 animals resided at Woburn Abbey alone, with others held in breeding centers throughout the world. In 1986, 22 deer were flown from Woburn Abbey to Peking, where, after a lengthy quarantine, they were released in the area of the old Imperial Park, where they had been discovered over 130 years ago. In China there are now fenced populations in Beijing, Dafeng, Tianezhou and Yuanyang. 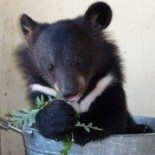 The last step – reintroduction to the wild – has yet to be taken, although a forest preserve has been selected for this purpose not far from where the last wild animal was shot. Currently, there are a total of 53 herds of E. davidianus in China. Nine herds have fewer than 25 deer, 75.5% have fewer than 10 deer (Yang et al., 2003). Such a small herd size raises question about the effective population size and health of population genetics, since those herds are isolated and there is no gene exchange. The artificially dispersed E. davidianus herds are similar to a meta-population. The viability of the meta-population depends on the man-made gene exchange process by the managers. In episode 6 of Wild China, during minutes 18-21, there is narration and footage of the wild herd of deer, including spectacular images of a stag self-adorned in rut. Interesting! I have seen these at The Wilds in Ohio, so it was nice to get a little more of a background on them. Thanks! Yes, we are fortunate that, according to the International Species Information System, there are about 900 Père David’s Deer in accredited zoos throughout the world. There could easily be that many or more in non-accredited zoos and in private collections. What a crazy history! And so cute, these deer! This entry was posted on June 22, 2014 by Maymie Higgins in Extinct in the Wild, Mammals, Wildlife.